One side benefit of gutting your house is that the walls gift you with all sorts of interesting things that previous owners somehow managed to lose in there, perhaps with a little 'assistance' from said house. Even a knit-friendly Valentine. 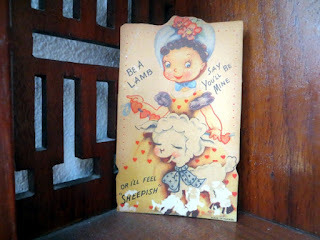 The Valentine - "Be a lamb, say you'll be mine or I'll be sheepish" - was originally given to Beryl from Beverly when the latter was old enough to print for herself, but not so old as to print neatly. SO CUTE. 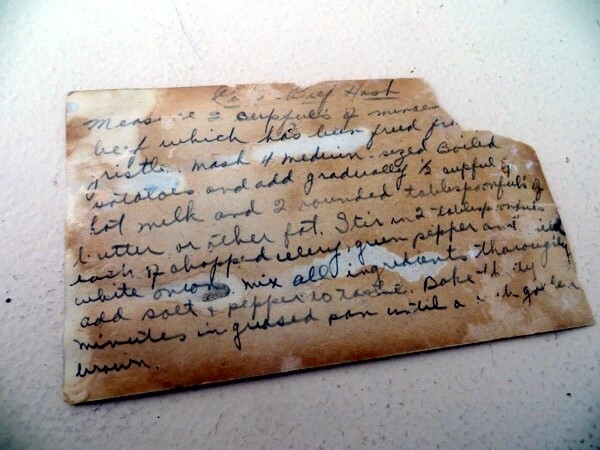 Other gifts: a recipe for Roast Beef Hash. "Measure 2 cupful of minced beef which has been freed from gristle. Mash 4 medium-sized boiled potatoes and add gradually 1/2 cupful of hot milk and 2 rounded tablespoonfuls of butter or other fat. Stir in 2 tablespoonfuls each of chopped celery, green pepper, and white onions. Mix all ingredients thoroughly. Add salt and pepper to taste. 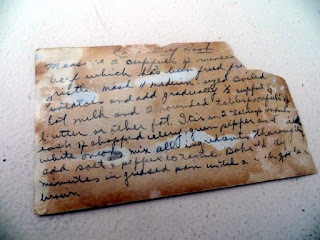 Bake thirty minutes in greased pan until a rich golden brown." That actually sounds delicious, perhaps because I've been eating so much salad lately. I wonder what temperature the oven should be? 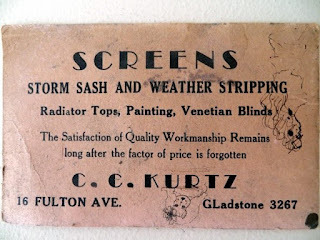 "The satisfaction of quality workmanship remains long after the factor of price is forgotten." So true! 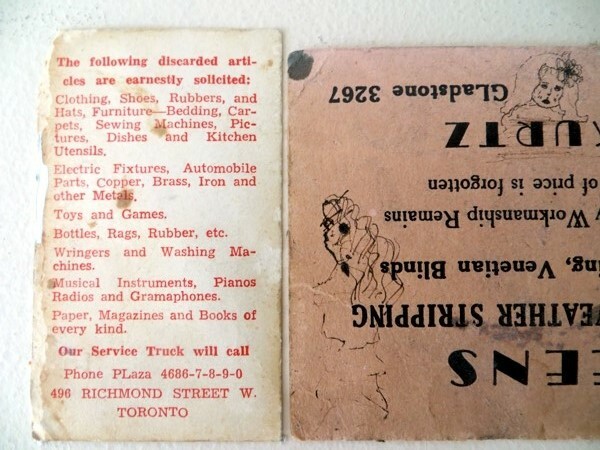 I was also intrigued by this request from the Salvation Army for items urgently needed in whatever year it was printed. You don't see so many requests for automobile parts from Goodwill. 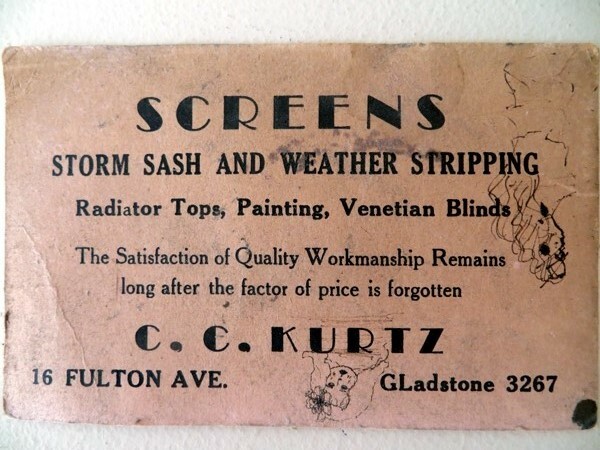 And what's not to love about those doodles on the ad for new screens? Seriously though: the house really is gutted. It's like walking into a skeleton. A skeleton that's so very much smaller than it seemed when it had all its working parts. I'm pretty sure the entire depth of our house is the same as the distance from the front door to the terrace window of our condo. I felt scared briefly that even with a new floor that takes the bedrooms out of the way, the house would still be too small after all this work, but the rest of the team reassured me that it'll be fine. Now to think of what meaningful yet everyday items we can stow in the walls as gifts for some future resident. It isn't going to be a pizza flyer, I'll tell you that much! While I wander off to ponder this important question, take care of yourself, and I'll see you tomorrow.